Added: View Arrest Warrant after running FBI Check. hi there, i think your fingerprint scanner is very fun, but i live outside de USA, i live in VENEZUELA, and i can’t buy the app trough appworld, i have a paypal account. there’s another way to get the application? How the hell do you work this thing? 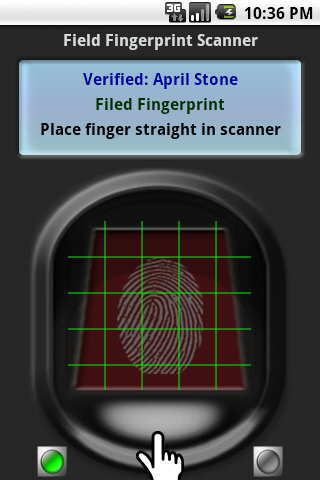 Ive inputed all my information, and did the mug shot thing but when I go to scan my “Fake” fingerprint it just says Verified: not on file. I even tried it with the grey dot at the top. Are you using the Android version or the BB Storm? hi, did it take a long time for this app do be downloaded? No it should not. It is a small download.